Hi everyone, this is such a cool site. I thought I would post this regarding the Hudson development. I could be the Cities, New Tallest! Here is a photo from the open house, Townline hosted at the Save on Foods arena, for the Hudson proposal. I went to the Town Line open house at the Arena that night. The developers were extremely nervous to show their plans for the towers, I think they were expecting to see a lot of nimbys out. I took these photos of the current state of the Bay Building. Concept rendering of the east facade of the Bay building. That eastern facade addition looks so good. Much better than a blank Wall. Mind you Some may say that the blank wall is heritage!!! AGHHH!!!! 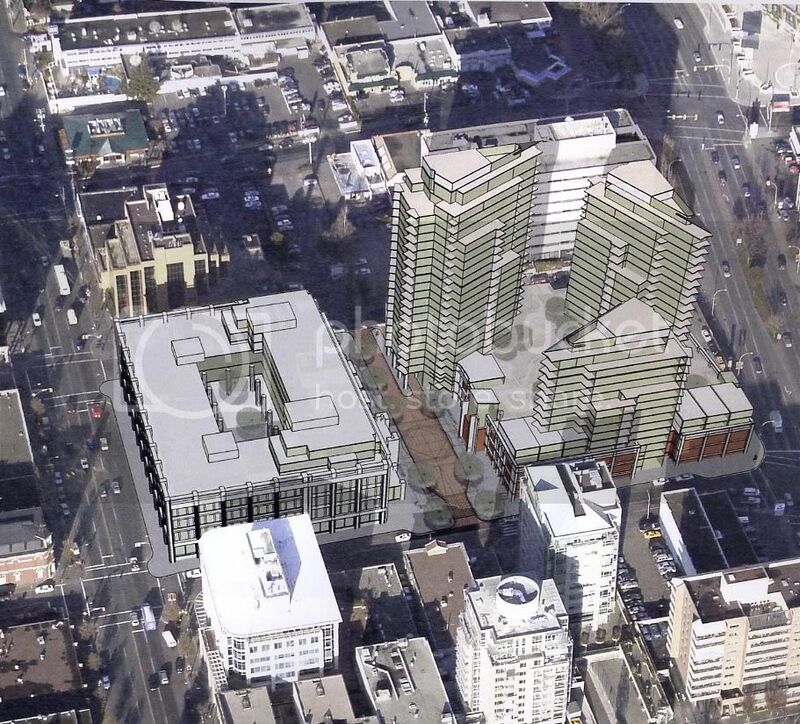 Anyways, Once the parkade is gone, and if that carriage way design gets a go ahead too, This block will be fantastic. I am very impressed with this whole project so far! Thanks for sharing the Facade design. Here are some photos I took the other day when I saw the crane, holding a camera man in a cage, so he could take photos for this proposal. Later when I drove by the crane was even higher. Nice shot of the BC Hydro land too. I didn't realize how large it is. As for the Hudson carriageway, there is no doubt is will be there, just whether they will allow cars to use it as a thru-way or make it pedestrian only (and cars entering the parkade). Looking at that view I'm reminded of the idea of using different colours of tinted glass the the Bay's three towers. There's already a lot of dark or mirrored glass around there obviously so any tint should probably be subtle. What do you think? I would have opted for a low-flying helicopter rather than an old crane. That's interesting. With one of those you'd be able to aim it straight down without getting anything in the shot. Probably a lot more expensive than simply hiring Bud and Darryl and their cheap crane. But hey, when you're spending close to $200,000,000 what's a few extra thousand? In this pic it looks like the top of the crane is at about the same height as the hypothetical 18th floor of Corazon. So concerns about the impact of tall buildings on the Bay parkade site would seem to be misplaced. You know, for such an itsy bitsy small town, it's amazing how Victoria's skyline takes on a totally different flavour from each of the varous viewpoints. Nice! We need to add one from the south, ie: taken from the deck of the Coho ferry. I am really excited to see these towers become reality on this property!!! If they allow cars on the Carriage Way I will be vocally against it at any meeting!!! but this is where the under ground parking lot is...and they mentioned something about a 3 minute parking out side the store for people pick up. What about disabled people who need picking up infront of the shop? or the residence who need to enter their underground parkade? They can have an entrance for the parking and a 5 minute zone along Fisgard or Herald but the space in-between The Bay building and the three towers should be pedestrian only. At the meeting they stated that planning instructed them to have the parking entrance for the first tower...the 25 to be off the carriageway...they didn't want it coming off the main streets. Here is an old photo of the Bay. Originally it was to be twice the height. Word is it goes before Committee of the Whole on Oct 5 at 9:00am. That is excellent. The way that hearing goes sets the tone for the ADP and APC which will follow shortly after.